Dimensions 1.50 by 5.50 by 8.50 in. Amazon.com description: Product Description: The definitive family biography of President Donald Trump. The revealing story of the Trumps mirrors Americaâs transformation from a land of striving immigrants to a world in which the aura of wealth alone can guarantee a fortune. The Trumps begins with a portrait of President Trumpâs immigrant grandfather, who as a young man built hotels for miners in Alaska during the Klondike gold rush. His son, Fred, took advantage of the New Deal, using government subsidies and loopholes to construct hugely successful housing developments in the 1940s and 1950s. The profits from Fredâs enterprises paved the way for President Trumpâs roller-coaster ride through the 1980s and 1990s into the new century. With his talent for extravagant exaggerationâhe calls it âtruthful hyperboleââPresident Trump turned the deal-making know-how of his forebears into an art form. By placing this much-publicized life within the context of family, Gwenda Blair adds a new dimension to the larger-than-life figure who ascended to the American Presidency. 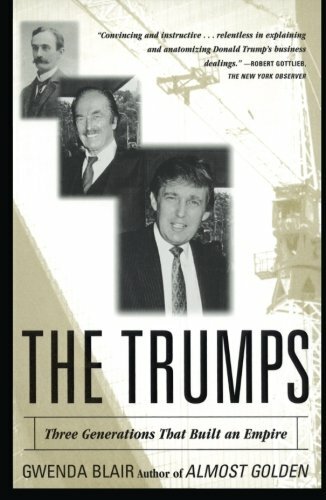 from Simon & Schuster (September 1, 2000); titled "The Trumps: Three Generations That Built an Empire"
About: A biography of three generations of a successful immigrant family profiles Friedrich, a brothel owner during the Klondike gold rush, son Fred, who built government-subsidized housing, and billionaire real-estate mogul Donald. Reprint edition from Simon & Schuster (December 1, 2001); titled "The Trumps: Three Generations That Built an Empire"
About: The definitive family biography of President Donald Trump.